Just spent a week showing Penny and Alan McIlroy from St. Louis what I love about San Francisco -- what a wild week! 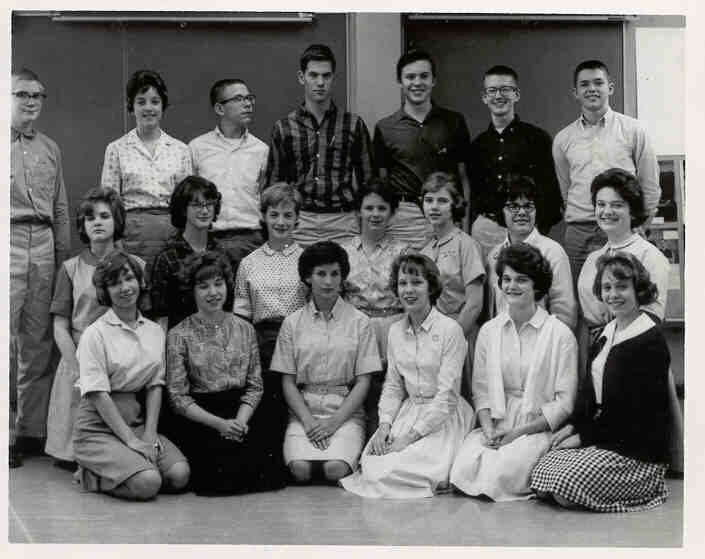 Alan and I met over 55 years ago in junior high (see photo at the end) and Penny and I have much in common when it comes to believing that life is too short to be subtle. We all had great conversations and we laughed a lot and yes, we agreed naps are worthwhile! Before they arrived, they read my book, "100 Things to Do in San Francisco Before You Die," so they had a lot of ideas about what they wanted to see. 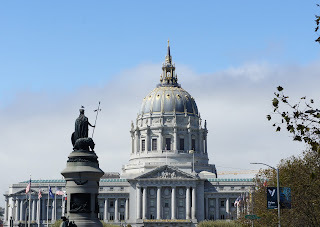 Plus, I adore playing tourist in my adopted city, so we made the most of their time here. They can tell you about their trip -- or you can read about it here. Enjoy! Welcome! Early supper at Ragazza’s – Moto pizza! 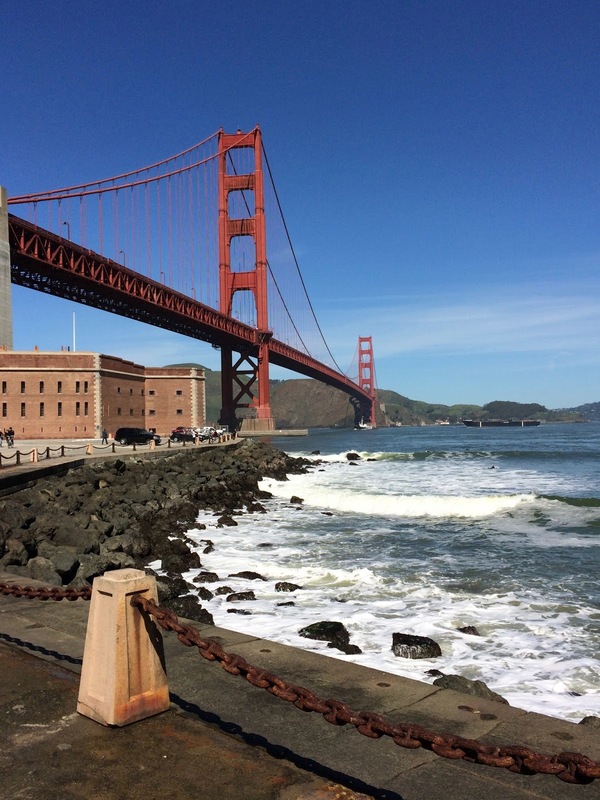 Rain-soaked tours of the Divisadero Drop (steep hill down to the Marina District), Crissy Field, Fort Point (almost under the Golden Gate Bridge), the Presidio, the tile staircase at Lincoln Park (which was filled by protesting students! 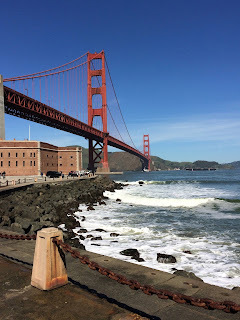 ), Fort Miley at Land’s End, Ocean Beach, tulips under Wilhelmina’s windmill, a drive-by visit with my beloved bison and a look at The Beautiful Houses of Waller Street, which I like better than the famous Painted Ladies. A short stroll on Pier 39 followed by the Blue and Gold Fleet excursion boat trip (https://www.blueandgoldfleet.com/) in San Francisco Bay under brilliant sunny skies! 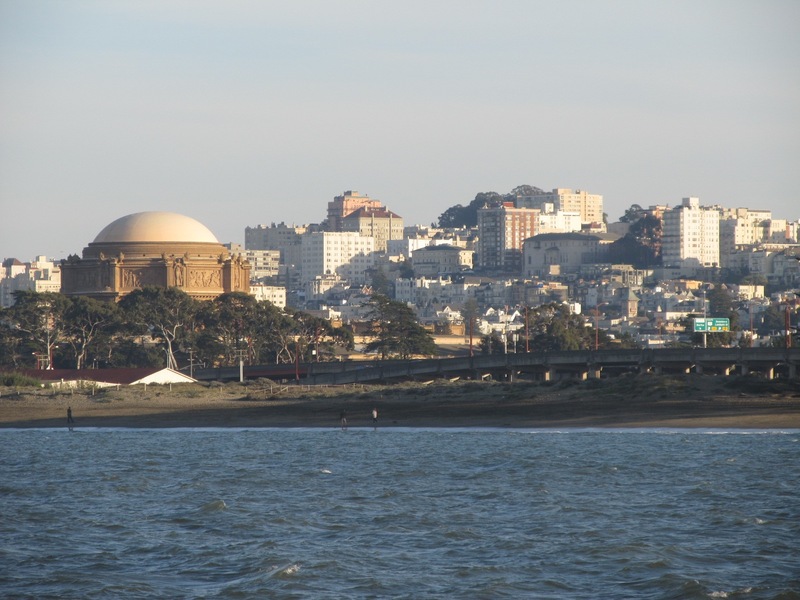 So cool to see the city from the water and sail under the Golden Gate Bridge! Waved at the cable cars, nixed a ride and went to our homes for an early night, tired from so much fresh air. 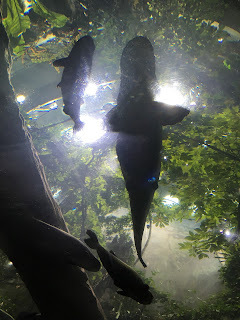 Taking in the sights at the amazing California Academy of Sciences (https://www.calacademy.org/): the manta rays, Claude the albino alligator, the five-story rainforest, a disappointing non-visit with the (often elusive) Giant Pacific Octopus, the Philippine Reef and a look at the film on the Farallon Islands, which are about 26 miles west of San Francisco – and are considered part of the Outer Richmond District. Lunch: High tea at Lovejoy’s Tea Room (https://www.lovejoystearoom.com/), followed by stops at Chocolate Covered and the Noe Valley Bakery (scones! quiche! double raisin bread!) in Noe Valley and picked up my grandson from school. Over the Golden Gate Bridge to West Marin, a trip that includes savoring being in the presence of towering redwoods in Samuel P. Taylor State Park! Lunch: Cheese toasties, ginger ale and pickled vegetables at a private table at the Cowgirl Creamery (https://www.cowgirlcreamery.com/) in Point Reyes Station. Next: A coffee stop at the Bovine Bakery, a quick trip into Toby’s Feed Barn for dried pears and a personal delivery at Coyuchi. 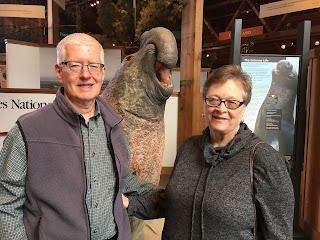 Popped in at Point Reyes National Seashore headquarters at Bear Valley, Penny and Alan posed with an elephant seal statue and we headed to Limantour Beach. 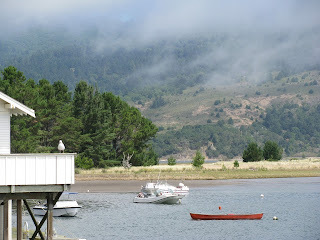 Then made a disappointing wine run to Bolinas and took a ride around the Bolinas Lagoon (saw a single heron) with its hidden secret (the San Andreas Fault runs under it!). Visited with Emmeline Craig at The Blissful Gallery in Stinson Beach (https://www.emmelinecraig.com/) and on the way home we made a trip up the hill in the Marin Headlands to look back at my favorite bridge. After some chill-out time, off to Audium, the soundscape program. A morning trip to Laurel Village shopping strip for toys and flowers, popped in at HyperOptics to hug A.J. and then checked out every pair of socks at the Haight Street Sock Shop (http://www.sockshopandshoeco.com/sockshop-haight/). Penny and Alan escape to Alcatraz – then we head to Susan Fox’s house for corned beef and cabbage – a lovely home visit with a native Californian! Driving tour of City Hall, Civic Center, the Tenderloin, China Town (saw a funeral procession), North Beach (saw the sad site of a four-alarm fire the day before), Nob Hill, the Tendernob and then past the Painted Ladies at Alamo Square. Lunch: The Beach Chalet (https://www.beachchalet.com/), complete with WPA murals and beer seeping out from under them, all over the floor! Stops to greet the friendly owners at 3 Fish Studios (https://www.3fishstudios.com/) and Avenues Dry Goods (https://avenuesdrygoods.com/). Alas, too long a line at Andytown Coffee. Pickup at the Wine Trading Company – aha! The shop had the wine that I could not find in Bolinas. Dinner: A smoothie tasting, cheese, crackers, fig spread, dried pears, caramel corn, DIVINE CRAB CAKES from Falletti’s, topped off with raspberry macarons! Penny and Alan head to the Hyde Street Pier and the Maritime Museum (https://www.nps.gov/safr/index.htm) to explore boats, see murals (a merman!) and watch hardy people swim in the protected bay. Farewell Lunch: Chicken kebabs, hummus and fish tacos at my fave hangout Café Reverie, followed by bowls of the rare and delicious roasted pineapple ice cream at the Ice Cream Bar. A drive up Twin Peaks (delayed because of rain – that’s usually where my tours start!) and through the Castro and then back to the Metro Hotel, where Penny and Alan caught the shuttle to the airport.